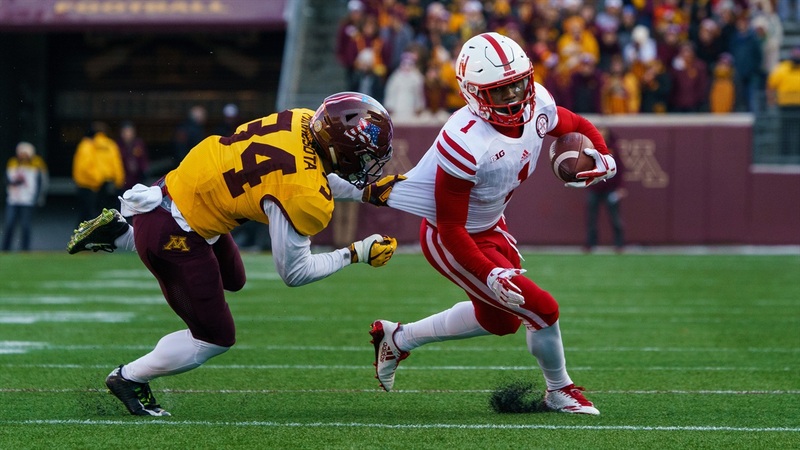 In 2014, De’Mornay Pierson-El burst onto the national scene as a freshman, racking up 596 yards and three touchdowns as one of the most dangerous punt returners in the country. Over his last three seasons as a Husker, Pierson-El only totaled 371 total return yards and he never found the end zone again on special teams. Injuries certainly played a part as he lost half of his sophomore year to a serious leg injury. However, even after he returned to full strength (or close to it) he rarely had any holes to run through when he dropped back to return punts. Last year for Central Florida, Mike Hughes returned 14 punts for 233 yards and a touchdown, 140 more yards on one less attempt than Nebraska in total. Hughes also averaged nearly 32 yards per kick return as well, about 7 yards more than Nebraska’s J.D. Spielman. Overall, Nebraska and Central Florida averaged the same number of punt returns per game (1.3) yet the Knights averaged more than twice as many yards per return. However, in Scott Frost’s first year at Central Florida, without Hughes — a projected first round pick in the 2018 NFL Draft — back there catching kicks, the Knights’ averages were right in line with Nebraska’s from this past season. So what kind of return game should fans expect in Lincoln next season? That depends on who earns the job. Pierson-El’s career in Lincoln is over. Two other players — Stanley Morgan Jr. and Tyjon Lindsey — returned one punt apiece for a total of one yard. That position is wide open heading into the spring. Morgan has two career punt returns and is the team’s top playmaker on offense. J.D. Spielman, last season’s kick returner, is dynamic with the ball in his hands but has said in the past that he’s not a punt returner. With a year of Division I football under his belt, Lindsey could push for the job, as could dynamic newcomers Miles Jones and Jaron Woodyard. Regardless of how the competition goes, Hughes’ role for Central Florida shows that this coaching staff doesn’t shy away from putting its best players on special teams. Dewitt said every job — including all 11 spots on all four special teams units — are up for grabs this spring, and they are not limiting the field of potential contributors. The cultural and philosophical shift in Lincoln has just begun, but based on Dewitt’s comments, it is going to impact all facets of the program as the new coaching staff tries to replicate the success it had in Orlando.